My Dearest Friends. Thank you so much for your encouragement and support. With regards to my writing and blogging I’ve been feeling on top of the world. Every one of you made me feel accepted and heard. Thank you. This community is so important to me and my sanity. I’ve spent the last week caught up on all things Harry Potter. I’m reading The Goblet of Fire, and I really appreciate and admire J.K. Rowling’s imagination and her easy to read writing style. It definitely makes it easy to escape to Hogwarts and get caught up in all the happenings. Sometimes that’s just what I need. It definitely makes me want to get back into my own fantasy world of Thelum, which I had created a few years ago. I am definitely in the state where I’m just absorbing all sources of inspiration. Doing that makes me feel good and inspired. Having others around you that inspire you is crucial to the creative process I think, and absolutely feel. My personal life is a mess, but I’m working through that. The fact that I’m fighting my way back to my writing makes life a lot more tolerable. I have missed it so much. I missed how it nourished my soul and made me feel alive, and it made me feel like perhaps everything wasn’t going to hell. These days I’m learning something new about myself all the time. It is so strange, but it definitely gives me more to write about. Music was always a way to replenish my writing well when it ran dry. These days I can listen to music and it makes me feel . . . period. Depression tends to make you feel isolated. For me it absolutely drained enjoyment and life out of everything. I’ve been so used to not feeling, that these days, when a catchy tune comes on, I can actually dance to it. One thing my therapist made me aware of is that happiness is not the opposite of being depressed. Living is the opposite of depression. So, live. Show your doubts, anxiety, and those nasty feelings that want to drag you down into the darkness, that it won’t steal your love of life. It won’t make you dead, or numb on the inside. If there is anyone dealing with depression, or with feelings of not being enough, know that it might not seem like it, but there are ways to feel okay within yourself, and eventually you will feel okay. Life might not be okay, but you . . . your inner self, can become okay. It is possible. Can I ask, what inspires you? What are other great ways to fill your creative well when it’s empty? 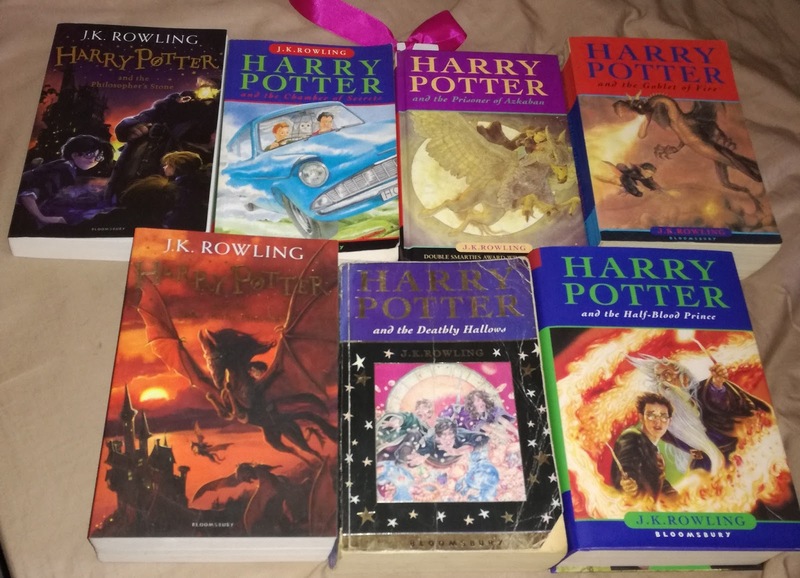 I've never read any of the Harry Potter books. Seen all the movies though. Music definitely inspires me. Listening to it and playing it. Keep fighting your way out of the darkness. I watched all the movies too;) I rather enjoyed them. But I got a lot of crap about not reading the books. Thank you, Alex. You rock. Thank you, Hilary. I'm glad you surround yourself with happiness, or at least go out to find it. That is one of the things I find so wonderful about you. I think J.K. Rowling is such a wonderful creative. To your question: I spend a lot of time with my dogs. Aw! Yes. My dogs hate it when I'm at my computer, or doing something. They want me to just stay put. But I love them a ton. One way I re-fill that creative well is by binge-reading and/or binge-watching, losing myself in others' stories. Thank you, Madeline. Oh yes! Binge reading, or watching TV. I'm on board. I am still waiting for my invitation to Hogwarts. When I get in, I'll insist that they send an invitation to you. Watching Franklin and Penelope chase each other in circles around the backyard inspires me. Those two know what pure joy is. Thank you, Janie. Hope you get your Hogwarts letter soon:) Our fur babies sure do make us happy. I wanted to let you know that I'm following your progress with much interest. I'm where you were and I'm fighting to get back. You can't hear, but this is me cheering you on, Murees. Thank you. I will be here to cheer you on too. You can overcome the darkness. Murees, come back, come back into the sunlight. I think of you as a brilliant flower and you bring so much joy to others, Share that joy with yourself. What great joy there is in being able to dance. Dancing was the greatest part of my life but now I dance for me, alone. I put on my shoes and do flamenco footwork on my wonderful floating floor. I laugh as I think of it being better than a can of oil for my rusty parts. Ha... shades of the tin man. Thank you, Belva. Flamenco footwork is amazing and complex, so good for you. I like dancing for myself too. No critic. You are lovely, Belva. What inspires me? Nature. My family. Prayer. I read the scriptures daily as well and inspirational talks from church leaders. All of these tend to keep me balanced from one perspective, but for creative inspiration? Life. Music. Reading. People watching. Dreaming. There are so many avenues to explore, and I think sometimes the best inspiration is just pulling out an old work and finding a nugget that I absolutely adore. Absolutely, Crystal. You are so lucky to have so many sources of inspiration. I'm definitely trying a few on your list. And don't forget the cheese while you're at it, eh? Cheese is great. I make lots of toasted cheese😋. I'm inspired by being outside in my favorite park, especially in the morning when it's quiet. I have come up with so many ideas during my morning walks. 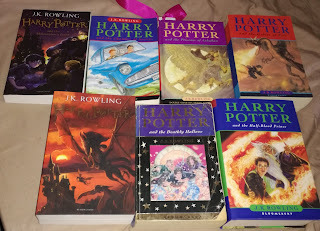 I love Harry Potter too and find it so hard to believe that the first book is 20 years old! That doesn't seem possible. Someday I'll have to read the whole series over again. I am glad to read that you are getting back to your writing inspirations, that warms my heart. I find writing so therapeutic too and it's helped me get back to a good place this year. Like others I am always cheering you on. I so admire you for sharing your journey here with us and being an inspiration to others. Hugs to you! Thank you, Julie. Your words truly comfort me. Your support is always appreciated. I couldn't believe I started reading the books, 20 years after the first had been published. It definitely seemed impossible. But the urge to read them now just showed up, and I wanted to do it. I just finished the series last night and I loved it. Hang in there and keep fighting! You can do it and you WILL get there! I always admire your openness and honesty. It's a wonderful character trait. I'm happy now that I wasn't the only one who hasn't read them. It definitely started to seem that way a few weeks ago. But I finished the series last night, and have to admit, I rather wish Hogwarts was real;) Thank you, Michelle. You are are very kind. When I really need to get away these movies always help. Music really helps me get into the right mindset.